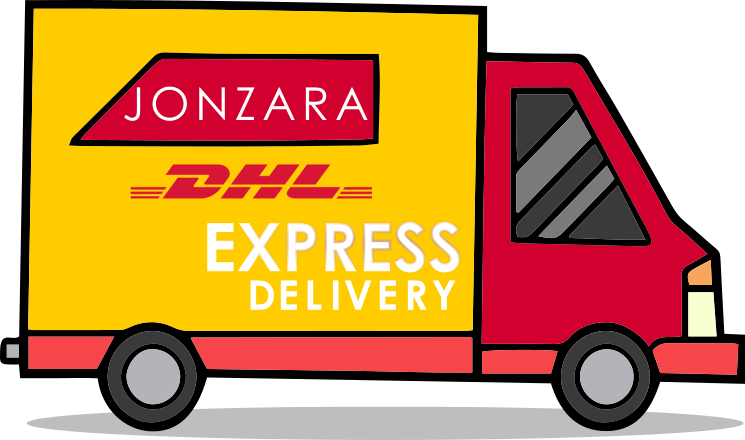 We take delivery seriously at Jonzara, all of our orders are sent using fully tracked information which we pass onto you, the customer so you can easily see where your parcel is at every step. Below are all of the delivery options available. If you have any queries, please feel free to contact our customer care team! Our standard delivery in the UK is via Royal Mail. We endevour to have your goods packaged and dispatched the same day, however we would ask to allow 3-5 working days for delivery. If you are not able to take delivery of your order a card will be left through your door asking you to come and collect it from your local post office. *Orders must be placed before 1pm on the previous working day to guarantee dispatch. Please Note: Next day delivery can be affected by public holidays in the UK and Northern Ireland. Type your Country below to find out shipping times!